HISTORICALLY, SCIENTIFIC AND EDUCATIONAL BOOKS FROM STUDIES WITHIN CALIFORNIA, THE CONCEPTS CAN BE CLASSIFIED INTO THREE CATEGORIES: THOSE DEVELOPED WILL BE GENERALLY USEFUL TO ENOLOÐ PROVIDING CONCEPTS AND PRINCIPLES, THOSE OFÐ GISTS THROUGHOUT THE WORLD. FERING GATHERED INFORMATION, AND THOSE PREÐ ALTHOUGH THIS VOLUME COVERS THE BASIC PRACÐ SENTING OPINION OR PERSPECTIVE (WHICH MAYOR TICES AND THEIR RATIONALE FOR SUCCESSFUL WINE MAY NOT BE INSTRUCTIVE). PRODUCTION, WINES AND WINE REGIONS OF THE WHILE THERE ARE MANY WINE-RELATED BOOKS OF WORLD AND DETAILS OF SPECIALTY WINE PRODUCTION THE THIRD KIND AND SOME OF THE SECOND, THERE (SUCH AS VERMOUTHS, FRUIT WINES, ETC. ) ARE OMITÐ ARE FEW OF THE FIRST, AND THIS BOOK ATTEMPTS TO TED AS SEPARATE TOPICS, ALTHOUGH INCORPORATED FILL THAT VOID. OF COURSE, SOME ASPECTS OF CATEÐ AS APPROPRIATE IN GENERAL EXPLANATIONS. THE GORIES TWO AND THREE INEVITABLY REMAIN. EMPHASIS UPON COMMERCIAL SCALE BY NO MEANS BECAUSE OUR TEACHING PROGRAM AT DAVIS HAS PRECLUDES USE OF THE MATERIAL BY SMALL-VOLUME ALWAYS BEEN BASED ON THE INTERDISCIPLINARY APÐ WINEMAKERS, FOR WHOM THE PRINCIPLES OF WINEÐ PROACH TO ENOLOGY, WE HAVE POOLED OUR EXPEÐ MAKING ARE EQUALLY VALID, ALTHOUGH PRACTICES RIENCE TO PROVIDE A VOLUME THAT PROVIDES THE MAY NEED TO BE ADJUSTED FOR THE SCALE. COMMERÐ BENEFITS OF SUCH INTERACTION AND DISCUSSION CIAL SCALE IMPLIES THE CONSIDERATION OF ECOÐ RATHER THAN THE MORE USUAL SELF-STYLED EXPERT NOMICS AND SENSIBLE EXPENDITURE OF EFFORT AND APPROACH TO SUCH BOOKS. Historically, scientific and educational books from studies within California, the concepts can be classified into three categories: those developed will be generally useful to enolo­ providing concepts and principles, those of­ gists throughout the world. fering gathered information, and those pre­ Although this volume covers the basic prac­ senting opinion or perspective (which mayor tices and their rationale for successful wine may not be instructive). production, wines and wine regions of the While there are many wine-related books of world and details of specialty wine production the third kind and some of the second, there (such as vermouths, fruit wines, etc. ) are omit­ are few of the first, and this book attempts to ted as separate topics, although incorporated fill that void. Of course, some aspects of cate­ as appropriate in general explanations. The gories two and three inevitably remain. emphasis upon commercial scale by no means Because our teaching program at Davis has precludes use of the material by small-volume always been based on the interdisciplinary ap­ winemakers, for whom the principles of wine­ proach to enology, we have pooled our expe­ making are equally valid, although practices rience to provide a volume that provides the may need to be adjusted for the scale. Commer­ benefits of such interaction and discussion cial scale implies the consideration of eco­ rather than the more usual self-styled expert nomics and sensible expenditure of effort and approach to such books. 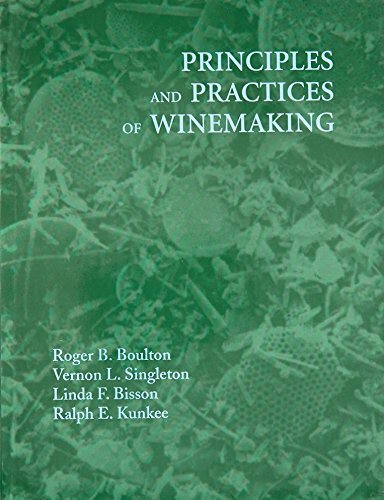 This essential text and reference offers a complete guide to winemaking. 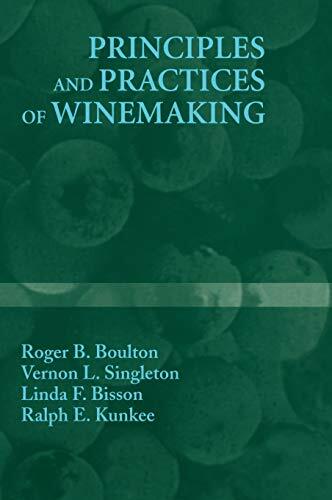 The authors, all well-known experts in their field, concentrate on the process of wine production, stressing the chemistry, biochemistry, microbiology and underlying science of enology. They present in-depth discussion of every aspect of the wine production process, from the selection of grapes and preparation of the must and the juice, through aging, bottling and storage of finished wines. 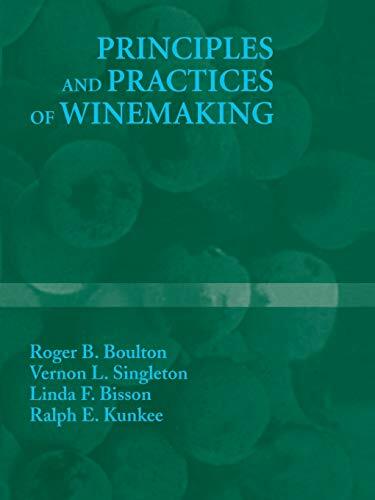 Novices and experienced winemakers alike will find this clearly written and expertly crafted book an indispensable source of practical instruction and information. Publicado por Springer-Verlag New York Inc.
Boulton, Roger B.; Singleton, Vernon L.; Bisson, Linda F.; Kunkee, Ralph E.
Boulton, Roger B. / Singleton, Vernon L.